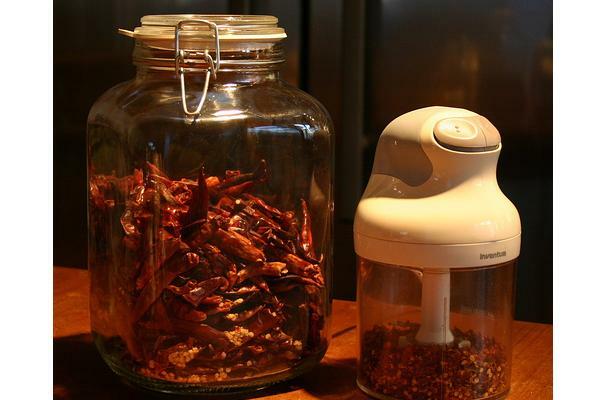 Dried and crushed hot chili peppers, typically any combination of ancho, bell, and cayenne peppers. Popular in Italian cooking, especially as a topping for pizza. Red circular, disk shaped flakes, typically with white/beige circular seeds. Can also be ground slightly finer, with a sandy texture. Choosing: Purchase a bottle in the spice section of a local grocery store that has not reached its expiration date. Buying: They are available at almost every grocery store. If they cannot be found, they can be bought in bulk at an asian/hispanic grocery store or places where bulk spices are sold. To accentuate flavor, simply crush flakes in the hands or with a glass against a counter top. Cooking in oil briefly will also accentuate heat, however extended cooking will mellow the heat. Cleaning: These do not need to be cleaned. They should be ready to use out of the spice bottle/bag. Store in a cool, dry place and watch for expiration date. Typically, they last years if they are store properly and are not contaminated with other foods or liquid.